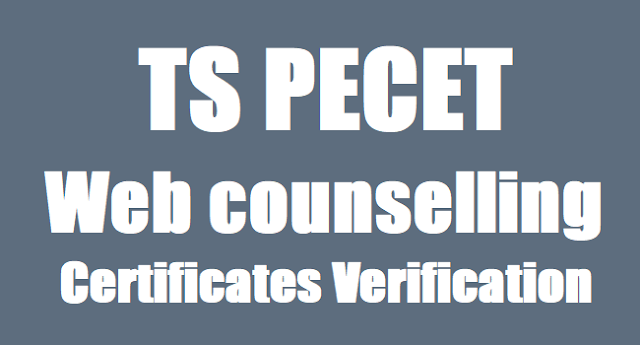 Final Phase TS/Telangana PECET 2019 Certificate Verification Dates for Web Options/Web based Counselling for Physical Education Courses Admissions 2019: A Common Entrance Test designated as Telangana State Physical Education Common Entrance Test (TSPECET 2019) will be conducted every year by Osmania University for the academic year 2019-2020 for seeking Admission into 2 Year B.P.Ed. and 2 year UG.D.P.Ed. Courses. The qualified candidates of TS PECET 2019 who have not attended for certificate verification earlier shall get their certificates verified at Helpline Center - Directorate of Admissions, Kakatiya University, Warangal-506009. Candidates are required to pay Processing fee of Rs.500/- for SC/ST and Rs. 800/- for others. of their employment outside T.S. from M.R.O in case of Non local candidates. • Income Certificate as per the G.O. and rules in force. authorities in the Government (Vide G.O.Ms.No.58, Social Welfare (J) Dept., Dt: 12-5-1997). • One set of Xerox copies of all certificates. 1st Phase Counselling: Osmania University issued the Telangana State Physical Education Common Entrance Test /TSPECET 2019 notification in April, 2019 and the Department of Physical Education, OU invited online applications from the eligible candidates for admission into BPEd and UG PED courses offered by the Universities and affiliated colleges in the Telangana state for the academic year 2019-2019 from ....-04-2019 to ...-05-2019. Applied PECET 2019 candidates were attended the PECET exam, which was held on May 29 2019. Appeared candidates were checked their results at its web portal. No, TSPECET officials has given the web based counseling notification for TSPECET 2019 Admissions. The Qualified candidates of TS PECET 2019 for admission into UGDPEd., BPEd course in Telangana State are informed that the certificate verification in Helpline centers will commence on ..-06-2019. For detailed notification, List of Helpline centers, Instruction Booklet, detailed procedure of web based counseling, admission procedures, list of colleges and schedule of second phase counseling if any, visit the website tspecet.tsche.ac.in./ http://pecetadm.tsche.ac.in/. University, Warangal. All qualified and eligible candidates are invited for the web counseling based on the available seats in each region and category. The qualified candidates of TS PECET-2019 who have not attended for certificate verification earlier shall get their certificates verified at Helpline Center - Director of PG Admissions, Kakatiya University, Warangal. Candidates are required to pay Processing fee of Rs.500/- forSC/ST and Rs. 800/ for others. 7. Residence certificate of father or mother for a period of 10 years in T.S. excluding the period of their employment outside T.S. from M.R.O in case of Non local candidates. 10. One set of Xerox copies of all certificate to be given at the help line centre. 11. In case of candidates seeking admission under SC, ST or BC Category, they have to submit an integrated community certificate prescribed by the Government and issued by the revenue authorities in the Government (Vide G.O.Ms.No.58, Social Welfare (J) Dept., Dt: 12-5-1997). 12. Candidates seeking the admission under CAP category should submit a certificate from the concerned Zilla Sainik Welfare officer in the prescribed proforma, along with original military discharge certificate, Identity card and pension certificate in case of pensioner. In case of children of serving armed forces personnel, they should produce a certificate issued by the commanding officer. 13. Candidates seeking the admission under NCC category should submit N.C.C Certificate issued by the appropriate authority. The candidates who got the allotment of seat should submit the originals to the colleges at the time of admissions. 1. Candidate has to get the certificates verified at Help Line Centre before he/she can start exercising options. 3. Exercise web options as per the schedule. 4. Allotment will be made in the order of preference of options and exercise utmost care while entering options. *Step 3: Enter your TSPECET-2019 Hall Ticket Number, Date of Birth and Rank and click “LOGIN”button to proceed. Select any one of the options either “registered mobile” (or) “registered emailid” to receive “5 digit PINnumber”. Click on “send PIN” button to receive the PIN. Do not share this PIN number with others. Note: To update your “registered mobile” click on “new mobile”. You will receive a PIN number to the updated “new mobile number”. (All alerts / notifications / messages will be sent to the updated mobile number.) Each time you login use the same “PIN number”. To sign out here click “sign out”. A window will appear displaying College details / Information for selection. Scroll Up/Down to view college list. Click on the check box to “SELECT” / “UNSELECT” the college. *applicant can select “ multi p le colleges” from th e li st disp layed in the window. Click “view checked” to view all the selected list of options. Click “uncheck” to clear list / clear all selected options. Use “search” field to access a particular college /Course/ College Type/ Fee Type/ District. Click “Add” to continue and proceed to view selected options. To Add more colleges click “Add Options” Button. *Step 8: Click “SAVE & CONTINUE” to proceed for the submission of priority list. Click “CONFIRM” to save the current options. The options can be modified later if required. Candidates can view the Final List of Colleges before Final Submission. Candidates can click “Back” Button to Edit / Remove / Add Colleges in the Final Priority List. Click “Final Submit” to submit the final options list. A copy of the options list is mailed to the candidates registered maid ID. Once “Final Submit” is clicked the candidate can’t make any kind of changes or edit the list of options. Candidate can down load the priority list from the email box using “registered mail id”. 1. Candidates are required to be present on the notified date and time at the helpline centre with all the relevant certificates and fee. 2. Candidates are called for registration rank-wise. The candidates are required to sign in the register and pay the processing fee and proceed for verification of certificates. Candidates belonging to SC / ST category have to pay Rs.500 /- and all others have to pay Rs.800/- towards processing fee which is non- refundable. 3. The candidates belong to BC/SC/ST Categories are required to submit integrated Community certificate duly signed by Mandal Revenue Officer [MRO]. 4. Tuition fee reimbursement will be as per the rules of Govt. of Telangana State. Income certificate issued by MRO after 01-01-2019 will only be considered. The students of Andhra Pradesh have to pay the full fees. 6. The verification officer will verify the genuinity of the certificates produced and collect the Xerox copies of certificates. 7. After verification, the candidate shall collect the Receipt of Certificates from the counter. 8. Candidates need to verify the mobile number, caste category, local area, gender, minority, parental income, special category, date of birth, eligible degree etc. Any discrepancy should be brought to the notice of Camp Officer / Co-ordinator immediately for corrections. Seat allotment process depends on the accuracy of the above data. You are also jointly responsible for ensuring the correctness of the data. 11. Candidate can download the provisional allotment order, and report at the concerned college. 12. For exercising options, the list of all eligible colleges and courses offered by each college is displayed on the internet. out of the Saved options. 15. Candidates are informed to check their final allotment, take printout of allotment letter from the web, and report to the respective colleges on or before the date furnished on the allotment letter, failing which the candidate will lose the admission. has to pay processing fee again as a fresh candidate. 17. If a candidate wishes to withdraw from counselling, he / she can do so by submitting an application to that effect to the co-ordinator, help line centre along with receipt of certificates. if any, will be conducted. 19. If a decision is taken to conduct second phase counselling, a separate notification will be placed in the website for the left over seats and new seats, if any, sanctioned. 20. Who should participate in Phase-II ? c. Candidates who did not participate in earlier phase even though he / she has been called for counselling. college, and has to report to the new college by downloading the allotment letter on or before the date furnished in the allotment letter. Failing to report within the date furnished in the allotted college, the candidate will forfeit the claim on the new college as well as on the old college. from the Principal of the college. 27 After the cut-off date for admission, in case the candidates wish to cancel their admission, they are required to approach the principal of the college concerned only. After completion of the first phase admissions, if there is any vacancy, the second phase web based counseling will be conducted. NO SECOND TIME CERTIFICATE VERIFICATION. The candidates who received the O.T.P can exercise web options directly through any internet center or from Home. The detailed procedure, vacancy position, for second phase will be placed in the website. TSPECET 2019 Certificates verification done for DPEd, BPEd Courses admissions for 2019. 2nd PhaseTSPECET 2019Certificate verification will commence from..-06-2019 andWeb Options will commence from..-06-2019.UGDPEd BPEd Admissions 2019 Counselling.